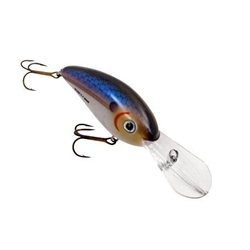 The Bomber Deep Fat Free Shad reach depths never seen before in a Fat Free Shad. These baits dive to 19 feet on a long cast with 10 pound line. The difference between these baits is that the Standard Deep Fat Free Shad features a rattle system, and the Silent Series without a rattle. Both have that magical bass-catching action that made the Bomber Fat Free Shad series the most successful in history.